A long and exhausting Day 3 has come to an end in Event #37: $1,000 No-Limit Hold'Em with Thomas Reynolds breaking through for his first tournament title. Reynolds is happily taking home $292,880 and a gold bracelet after defeating James Hughes (2nd place - $180,919) in a long heads-up battle. Both players mentioned they were getting tired near the end of heads-up play which may have led to Reynolds making an all-in call with a straight and flush draw. The board was and Reynolds led out for 900,000. Hughes moved all-in for 2,780,000 and Reynolds called tabling vs Hughes' . The river landed the giving Reynolds his flush and the victory. The two players duked it out for 109 hands before a winner was crowned. Reynolds had just over $11,000 in earnings before today's finish and booked his first World Series of Poker cash to go along with his first career win. He says, "I love playing poker. My wife's very understanding." Reynolds thinks of himself as a family man, with a passion for poker and is a fan of UNC. When asked how he felt about this achievement he said, "It feels kinda unreal to tell you the truth, but you know, it's something I wanted to try to do. It's an amazing feeling." He talked a bit about how he approached the field and that his wife says, "Be patient, Tom." He laughed and continued, "I'm glad I didn't know there were that many pros. It probably would've put more pressure on me." The heads-up battle was a long one, but Reynolds explained that he felt good about it. "First I was a little nervous. I hadn't played that much heads-up like that. And the speed. I felt in control in the beginning, but it got tight at the end." Reynolds now has over $303,000 in cashes, along with a coveted gold bracelet to bring home to his family who was following along with the updates all day. He plans on leaving Las Vegas for a short while to go on a holiday with his family but will be back for the Main Event now that he has paid his way. "I hope you get to interview me again," he laughed. The tournament gained a total of 2,020 entries on Day 1 with 303 players reaching the money and earning at least $1,502. There were many notables that finished in the money and they include Anthony Spinella (23rd place - $9,209), defending champion Chase Bianchi (28th place - $7,492), Mark Seif (48th place - $5,131), Ryan Laplante (52nd place - $5,131), and Barry Greenstein (61st place - $4,319). The official table got underway after the elimination of Daniel Deveau (10th place - $18,720) who ran his pocket kings into the pocket aces of Hampton. It only took three hands for the next elimination to come along as Joep Raemaekers (9th place - $23,460) was next to fall. He got all of his chips in the middle with top pair against his opponent's two over cards, straight draw, and a flush draw, and wasn't able to hold on. The next bust out came even faster, in the very next hand, as Chad Eveslage (8th place - $30,448) lost with his against Hughes' . After three quick knockouts, it took another 118 hands until Chris Johnson (7th place -$39,937) hit the rail. Johnson lost a flip to Hughes, which started the next chain of bust outs. In the next hand, Vlad Darie (6th place - $52,932) was all-in with pocket sevens against the pocket jacks of Hughes. Darie couldn't hit a seven and was the next casualty. Michael Gathy (5th place - $70,884) put up a good fight on the final table, doubling up several times while being the short stack. Unfortunately, his time came to and end in fifth place as his string of luck ran out. Eric Blair (4th place - $95,899) became the new short stack on the table and after a couple of limpers in front of him, Blair shoved all-in from the small blind. Reynolds push all-in over the top and his opponent in rough shape. Reynolds tabled against Blair's . Blair could not hit a jack and was sent to the rail. Players went on a break and when they returned, Reginald Hampton (3rd place - $131,061) was all-in with ace-king vs ace-jack of Reynolds. Reynolds hit a jack on the flop and Hampton was ousted in third place. That paved the way for the heads-up match between Reynolds and Hughes. That wraps things up for Event #37 on this late night, but continue to follow along with PokerNews for updates on every event throughout the summer. 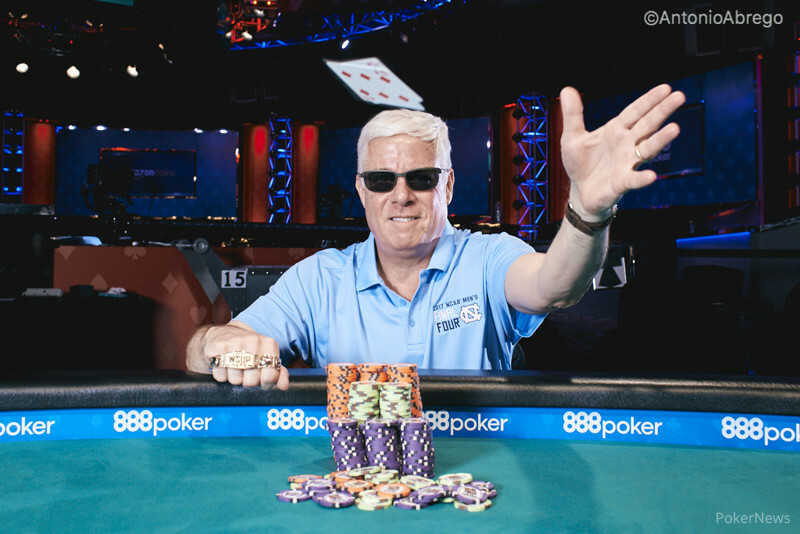 Hand #269: James Hughes raised to 260,000 and Thomas Reynolds called. The flop came and Reynolds check-called a bet of 300,000. The turn was the and Reynolds led out for 900,000. Hughes thought for a couple minutes and then raised all-in for 2,780,000. The action was back on Reynolds and he thought for a moment before tossing in a chip for a call. Hughes was out front with and Reynolds had a straight and flush draw with . The river brought the and Reynolds made his flush. 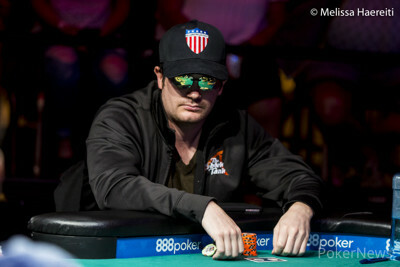 Hughes was eliminated in second place and will take home just over $180,000 for his efforts today. Hand #267: James Hughes called on the button and Thomas Reynolds raised to 320,000 to win the pot. Hand #268: Reynolds limped the button and Hughes checked. The flop came and both players checked to the turn. Reynolds bet 200,000 and took down the pot. Hand #262: James Hughes got a walk. Hand #263: Thomas Reynolds got a walk. Hand #264: Reynolds called and Hughes checked. The flop came and both players checked to the on the turn. Hughes bet 180,000 and Reynolds called. The river was the , Hughes checked, Reynolds bet 500,000 and Hughes mucked. Hand #265: Hughes called. Reynolds checked. The flop came and both players checked. The turn was the and Reynolds check-folded to a bet of 230,000 from Hughes. Hand #266: Reynolds called and Hughes checked his option. The flop came and both players checked down through the on the turn and the on the river. Hughes showed and Reynolds tabled to win the pot. Hand #257: James Hughes folded his button. Hand #258: Thomas Reynolds called on the button and Hughes checked. The board came as both players checked it down. 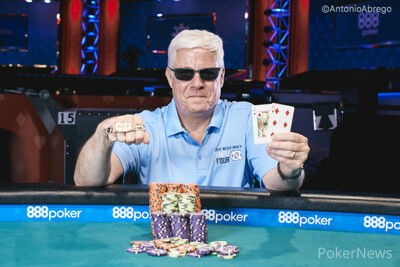 Hughes showed to win the hand. Hand #259: Hughes folded his button again. Hand #260: Reynolds called on the button and Hughes checked. The flop came and Reynolds bet 150,000 which Hughes called. Hughes also check-called a bet of 300,000 on the turn. The river brought the and Reynolds pushed all-in, finally getting his opponent to fold. Hand #261: Hughes raised to 260,000 and Reynolds called. The flop came and Hughes bet 235,000. Reynolds raised to 500,000 and Hughes moved all-in for 1,700,000. Reynolds called and the cards were tabled. Hughes was ahead with and Reynolds had a flush draw with . The turn was the and the river was the . Hughes doubled up and the match continues. Hand #252: James Hughes got a walk. Hand #253: Hughes raised to 315,000 and Reynolds called. The flop came , Reynolds checked, Hughes bet 240,000 and Reynolds folded. Hand #254: Reynolds called and Hughes checked. The flop came and both players checked. The turn was the , Hughes checked, Reynolds bet 200,000 and Hughes mucked. Hand #255: Hughes called and Reynolds checked. The flop came and Reynolds check-called a bet of 130,000 from Hughes. The turn was the and both players checked to the on the river. Reynolds checked and Hughes bet 200,000. Reynolds called and Hughes mucked. Reynolds showed anyway, revealing for a flopped straight. Hand #256: Reynolds called and Hughes checked. The flop came and both players checked. The turn was the and Hughes check-folded to a bet of 250,000 from Reynolds. Hand #247: James Hughes folded the button. Hand #248: Thomas Reynolds called on the button and Hughes checked. Both players checked the whole way with the board reading and Hughes tabled to win the hand. Hand #249: Hughes raised to 260,000 and Reynolds folded. Hand #250: Reynolds limped the button and Hughes checked. The flop came and both players checked. The turn was the and Reynolds bet 250,000 to win the hand. Hand #251: Hughes called on the button and Reynolds raised to 320,000 to scoop the pot. Hand #242: Thomas Reynolds called and James Hughes moved all in. Reynolds folded. Hand #243: Hughes raised to 260,000 and Reynolds called. The flop came and Reynolds check-called a bet of 230,000 from Hughes. The turn was the and both players checked to the on the river. Reynolds bet 450,000 and Hughes called. Reynolds tabled for two pair and Hughes showed for a flush. Hand #244: Reynolds called and Hughes checked his option. The flop came and Hughes check-folded to a bet of 120,000 from Reynolds. Hand #245: Reynolds got a walk. Hand #246: Reynolds called and Hughes checked. The flop came and both players checked. The turn was the . Hughes bet 150,000, Reynolds raised to 300,000 and Hughes snap-mucked.